In HoudiniEsq 2.0, you have the ability to toggle all billing functionality system-wide if you have Admin-level access on your staff profile. Simply click the gear icon in the top right of the interface to access the Settings menu. 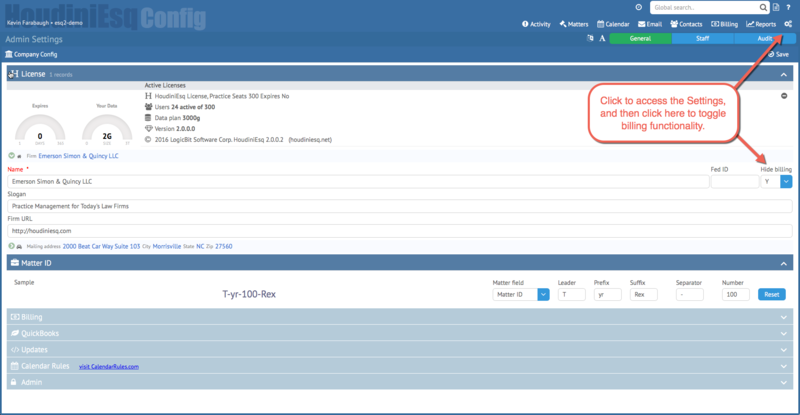 In the Firm information area, you will see the toggle to Hide Billing. Switching this value to “Y” and then clicking Save will toggle off all billing functionality. All Events will not display billable values, and the Billing section of the program will be hidden and not accessible. Matter records will also no longer have an Expenses, Invoices or Trust section. Keep in mind that this toggle only hides Billing information. It can be switched on and off at will without any fear of data loss. Any billing information in the program will still persist, and will be visible the next time the toggle is switched.